This is a perfect example of eating your own dog food. 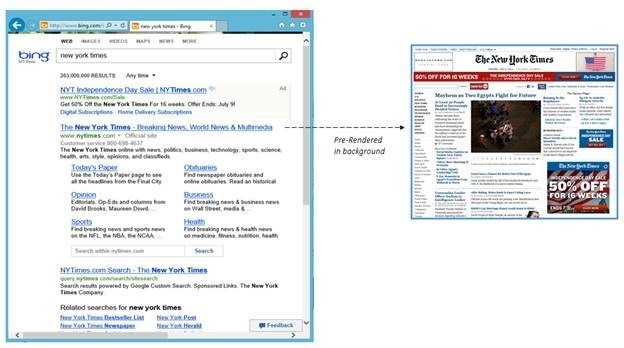 Microsoft today announced it has implemented Internet Explorer 11’s new pre-render tag in Bing. If you’re using Microsoft’s latest browser, you’ll notice that when you perform a search in Bing, clicking on the top result will result in an almost-instantly loaded page. This is because IE11’s pre-render tag downloads and renders a given page in the background (Microsoft says this is done “in a streamlined fashion taking care to not waste your bandwidth and battery life”). Microsoft says half of Bing users click on the first result on the results page, so it definitely makes sense to grab the first search result, but how does this scale with the speed of one’s Internet connection? Microsoft will presumably experiment with the trade-off between pre-rendering the first search result compared to the first two, the first three, and so on. Microsoft bills pre-rendering pages as part of its goal to improve the overall task completion time on Bing. What makes this addition particularly interesting is that it’s only available in IE11, so this is clearly part of the company’s long-term play. Most Web developers will only bother doing this if they see IE11 adoption on their site skyrocket. That’s a long ways away.